Happy Wednesday! 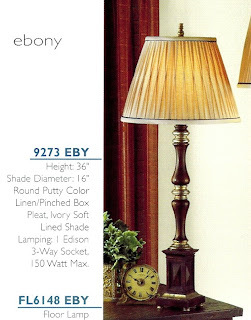 Today's Red Tag feature is a table lamp ~ Murray Feiss 9273EBY. This lamp has a grand scale of 36" high and takes a 150-watt 3-way light bulb. It's from their Charring Cross Collection, done in an Ebony finish with a 16" shade in a round putty color linen/pinched box pleat. Our original price on it was $158.40, but we now have it marked down to $98. So handsome!